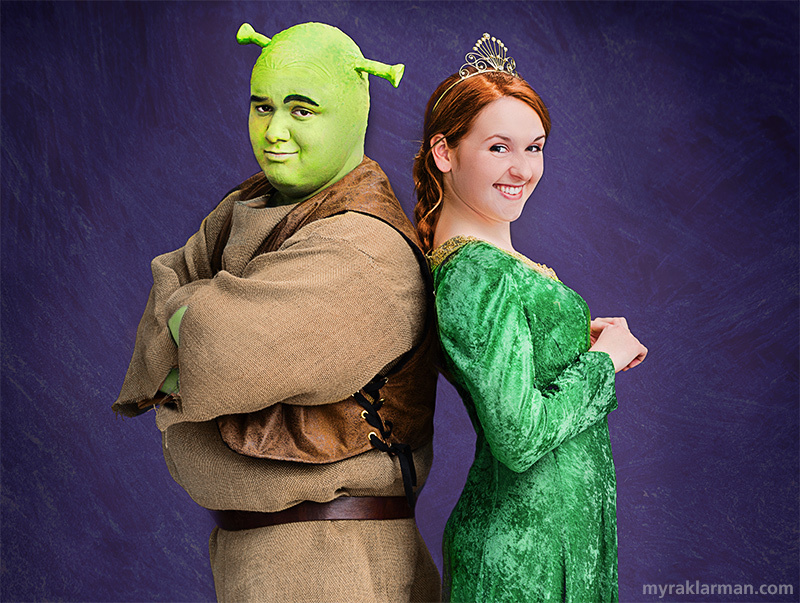 Publicity photo with Andrew Nazzaro and Hannah Hesseltine. 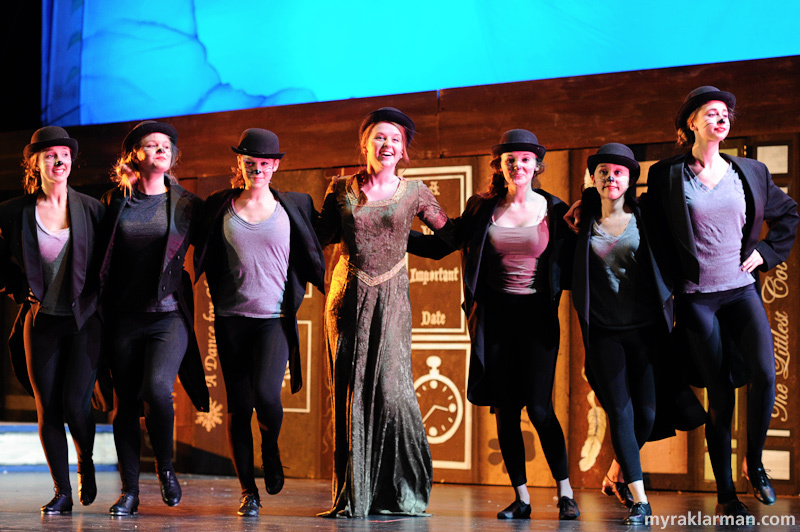 Pioneer Theatre Guild didn’t just “do” Shrek The Musical. 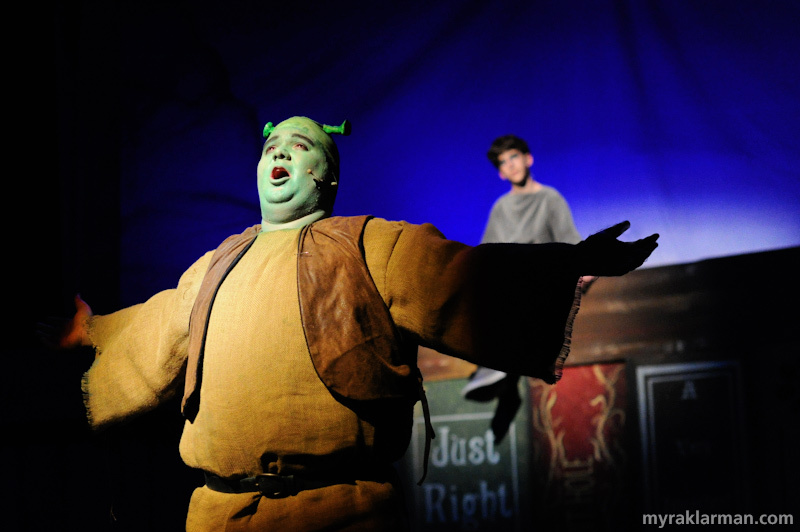 Rather, they were entrusted to test and design Shrek The Musical for other amateur theatre groups — in a process known as “workshopping” a show. 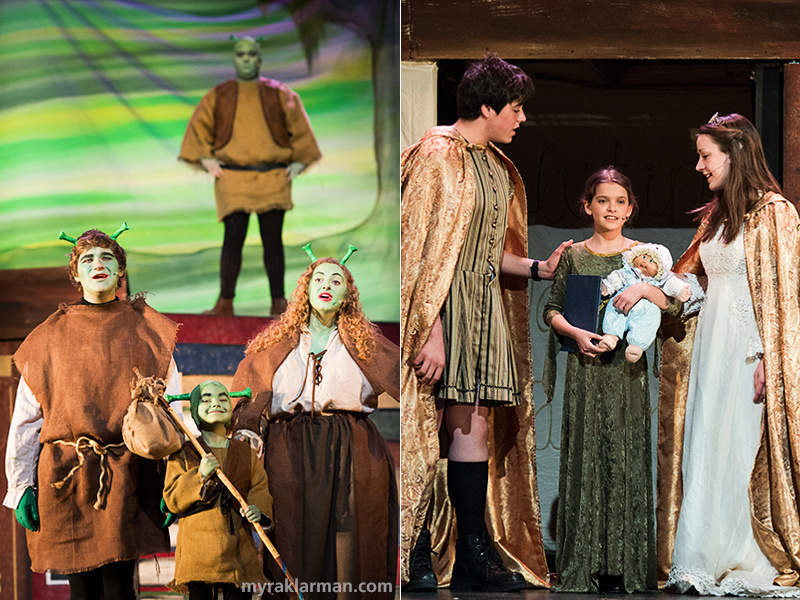 Shrek marks the third time PTG has been chosen by Music Theater International for this opportunity and honor (they also workshopped Willy Wonka and Miss Saigon School Edition). The insanely creative and dedicated PTG team rose to the challenge, and I have no doubt their production will inspire countless others. 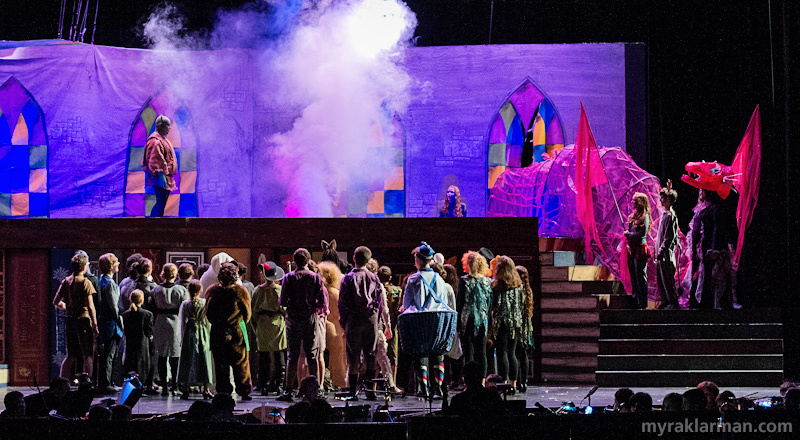 But, puh’leez, let’s get real — no other production will ever have a cast as talented and as awesome as THIS one, which drew students from four Ann Arbor high schools. No one is going to out-Shrek Andrew Nazzaro. Or out-sing Hannah Hesseltine and Tiona Griffin. No Donkey is going to be as irresistible as Isaac Scobey-Thal. And Michael Shapiro literally brought me to my knees with his Farquaad. The PTG cast set the bar impossibly high. Bravo to the entire team and their crews for conceiving and executing such a gorgeous production, including Alex Kip, Susan Hurwitz, Mysti Plummer, Kasia Mrozewska-Fenz, Ciara Stella Linden, Kris Park, Nora Curtis, Kate Van Horn, Robert Ariza, Tyler Driskill, Michael Hartung, Schuyler Robinson, Tim VanRiper, Claire Crause, Laura Munson, Patrick Schrock, Kathy Lloyd, Sophia Saks, Paula Doering, and Kate Summers. 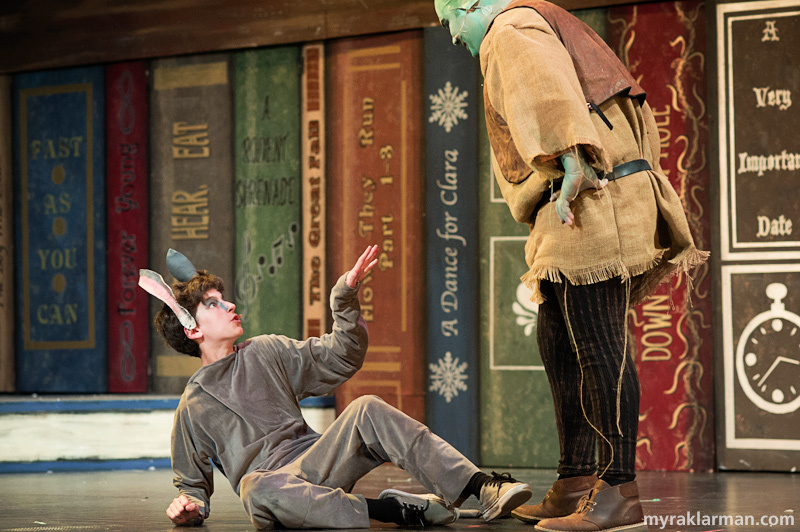 Current day Shrek (Andrew Nazzaro) “saves” 7-year-old Shrek (Ethan Steiner) from an angry mob about to burn him at the stake. Shrek (Andrew Nazzaro) just demonstrated his gardening prowess. A little potassium-rich flatulence in the flowers’ general direction, et voilà — we have blooms. Nicely done, props! A menagerie of fairy tale characters are despondent to find themselves exiled from the Kingdom of Duloc and relocated to Shrek’s swamp. 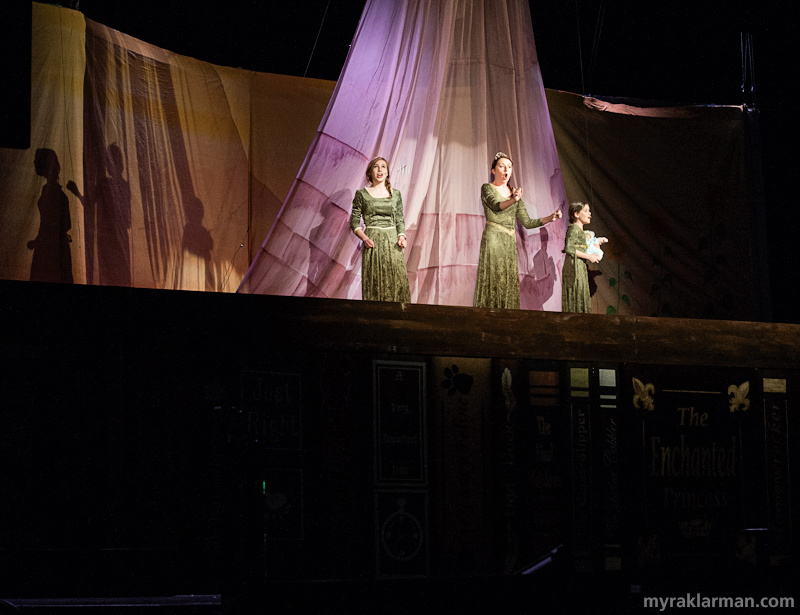 The stage design takes the form of giant book shelf. 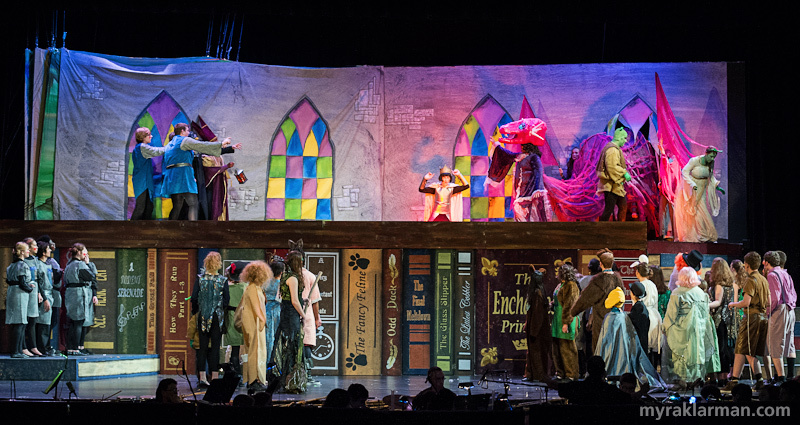 The painted fabric backdrops are changed from scene to scene via an ingenious storybook metaphor — the “page” is turned by characters on the stage. Even after they break her gingerbread leg, Gingy (Tasha Thomas) refuses to tell Lord Farquaad (Michael Shapiro) where the Princess is held. She finally talks when Farquaad threatens to pull off her gum-drop buttons. 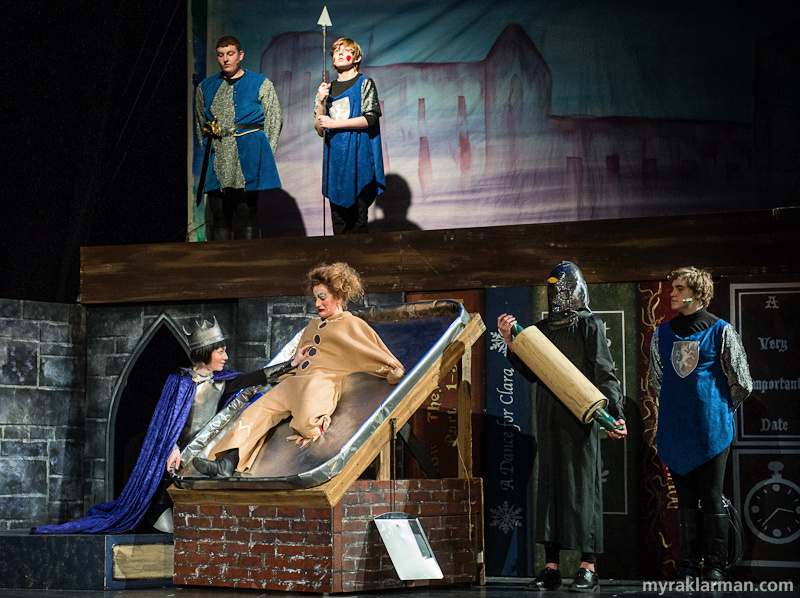 The giant cookie sheet is one of my favorite set pieces of all time. 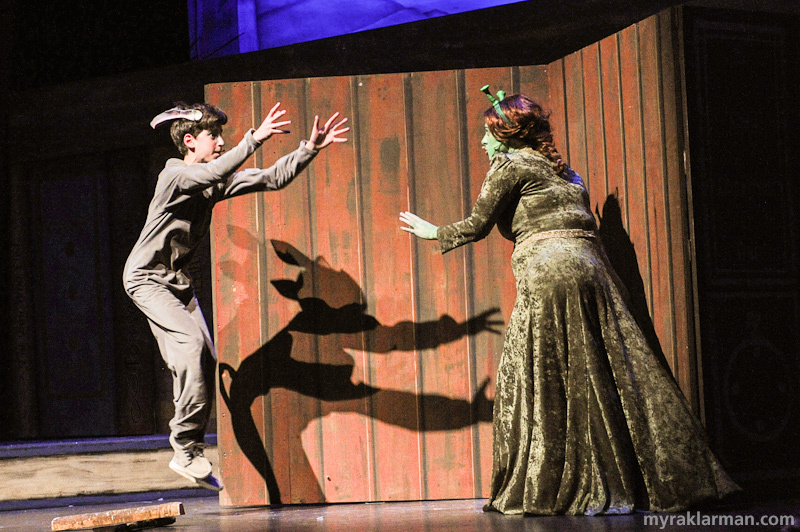 “Punch Buggy!” Nothing can deter the hyper-excited Donkey (Isaac Scobey-Thal) from befriending Shrek. Not even Shrek. All freaks and quirks are banished from Duloc. 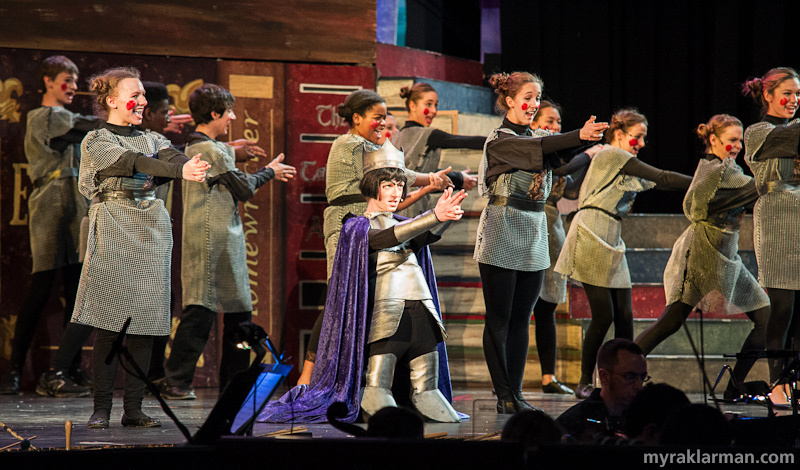 Lord Farquaad (Michael Shapiro) aims for robot-like conformity. 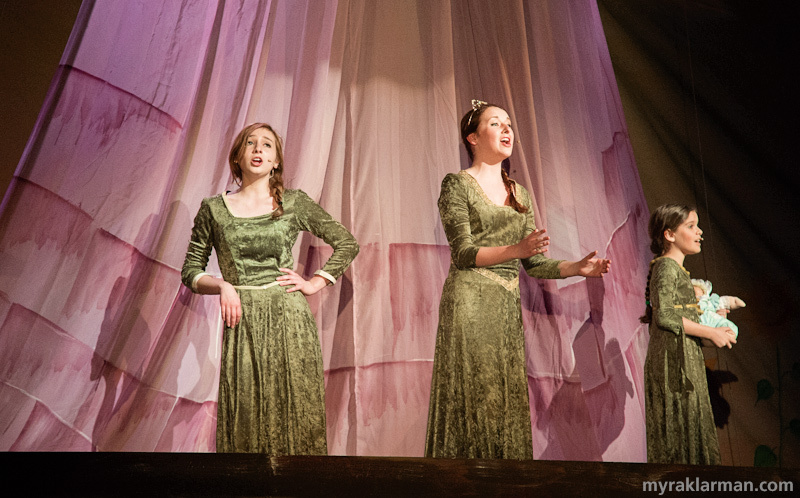 (l-r) Princess Fiona as a teenager (Alexa Zielinski), as a woman (Hannah Hasseltine), and as a young girl (Dana Steiner). Donkey and Shrek actually appear to be traversing a rickety old bridge above a fiery pit. Well done, production designers! The Dragon (Tionna Griffin) takes the stage. 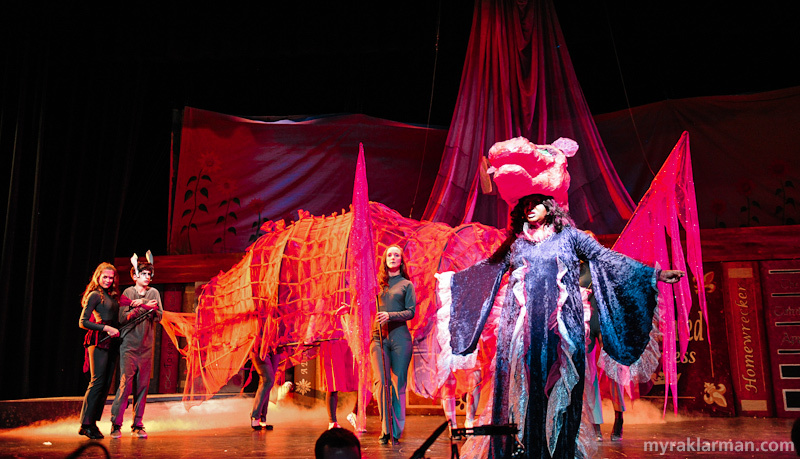 Six additional cast members — one at each wing, one at the tail, and three in the body — help bring this mythical creature to life. 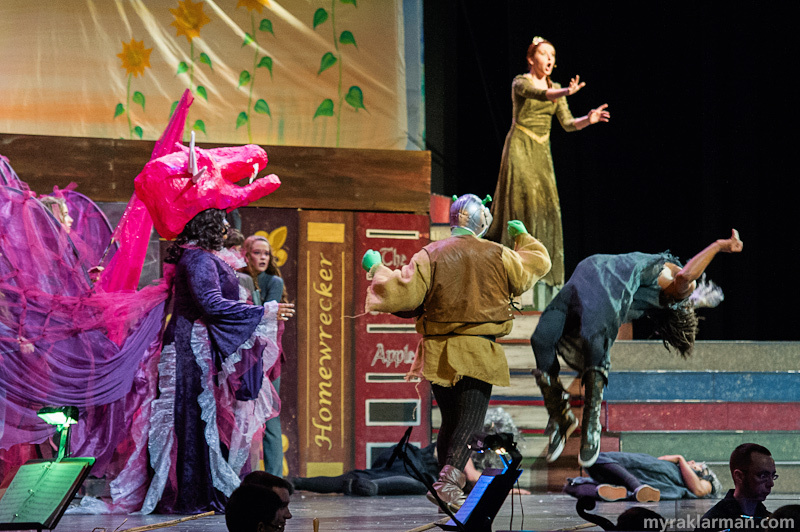 The entire dragon was created by senior, and costume crew mentor, Mitch Fehrle. The fight. Kudos to Sena Adjei for the perfectly executed back-flip (and for timing it just when I was ready to capture it)! 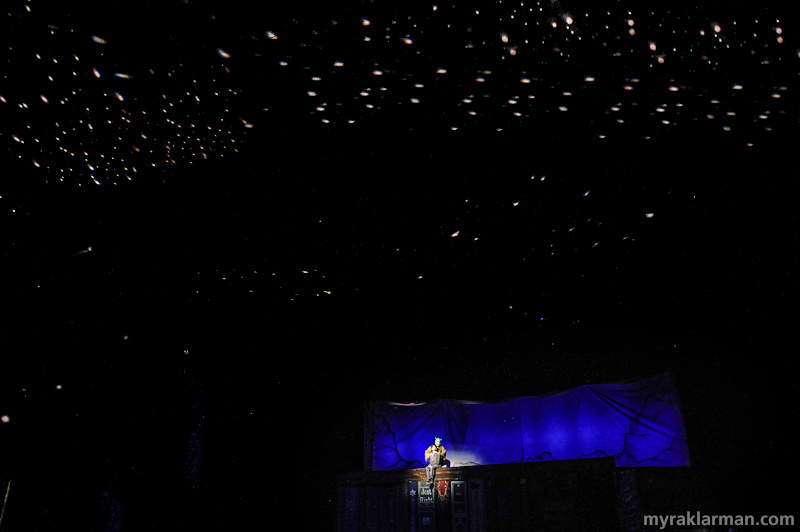 The beautiful night-sky envelops the audience in Schreiber Auditorium. Andrew Nazarro’s rendition of “What I’d Be” gave me major goosebumps. 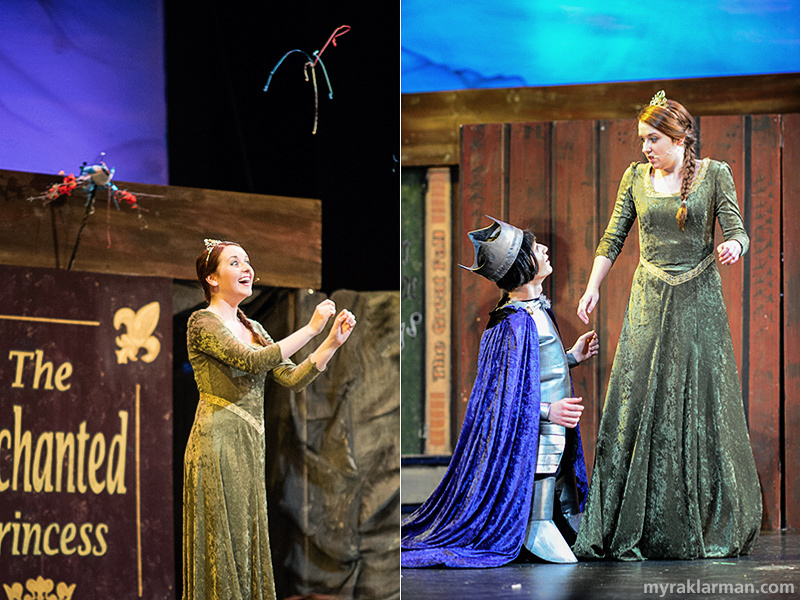 In the morning, Princess Fiona (Hannah Hesseltine) sings and dances with all the forest animals, including the rats. 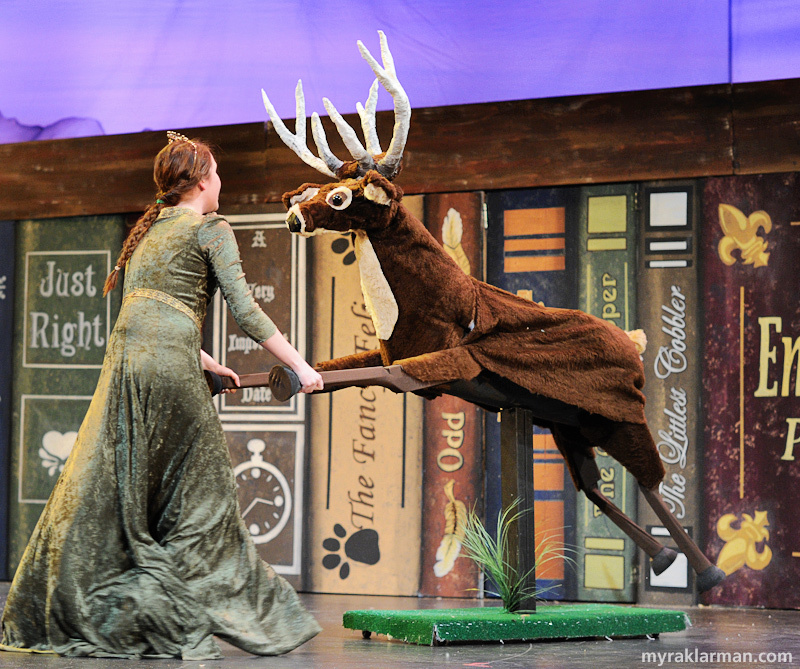 Another coup for the props team: a dancing deer! “I Got You Beat,” eventually devolves into a battle of the grossest bodily noises. 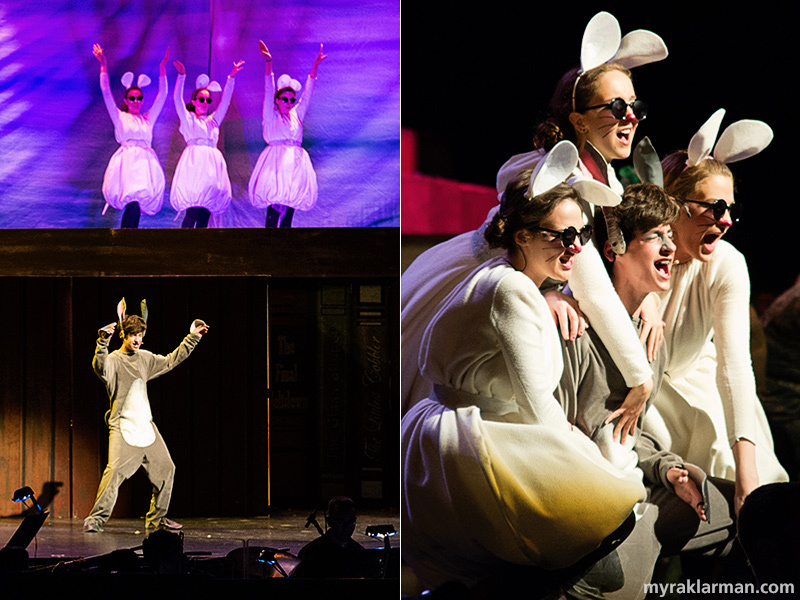 Tim Van Riper, assistant music director and PTG alum, mimicked an assortment of fart sounds from the orchestra pit. 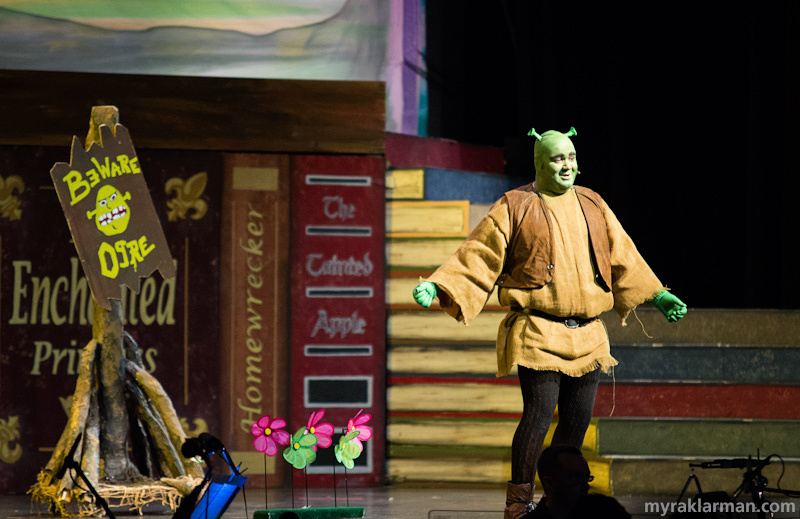 My sources tell me that Shrek (Andrew Nazzaro) and Fiona (Hannah Hesseltine) never knew which particular fart noise Tim was going to make next — or for how long — which made for some hilarious improvisation. The “Ballad of Farquaad,” chronicles Lord Farquaad’s ignominious pedigree. Long story short: his daddy was a grumpy miner (as in, “Heigh ho! Heigh ho! It’s off to work we go!”). 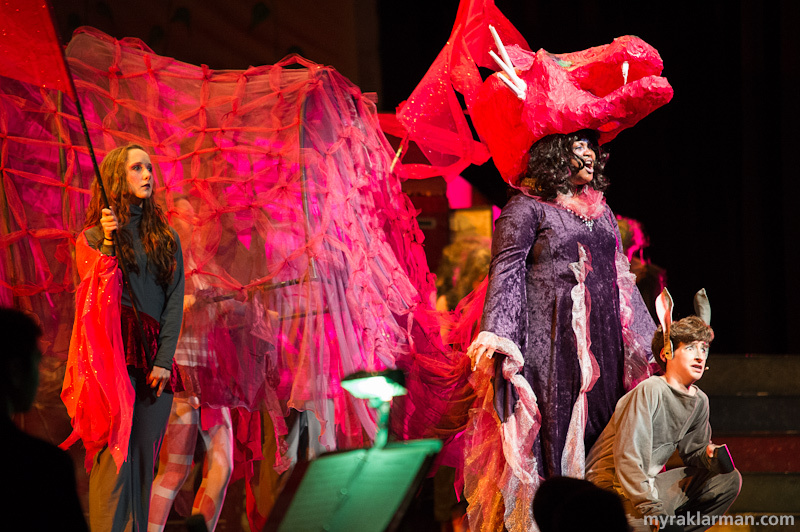 Donkey (Isaac Scobey-Thal) discovers Fiona in her ogress form (Karina Stribley). And how perfect is Donkey’s shadow? 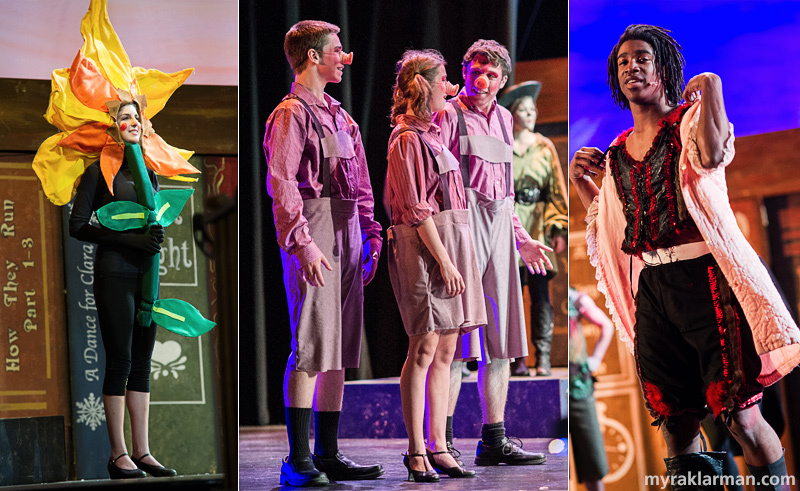 Lead by Pinocchio (Jordan McKay), the fairy tale creatures let their freak flags fly! A closer look at some of the costumes: Wicked Witch (Kelsey Detering). 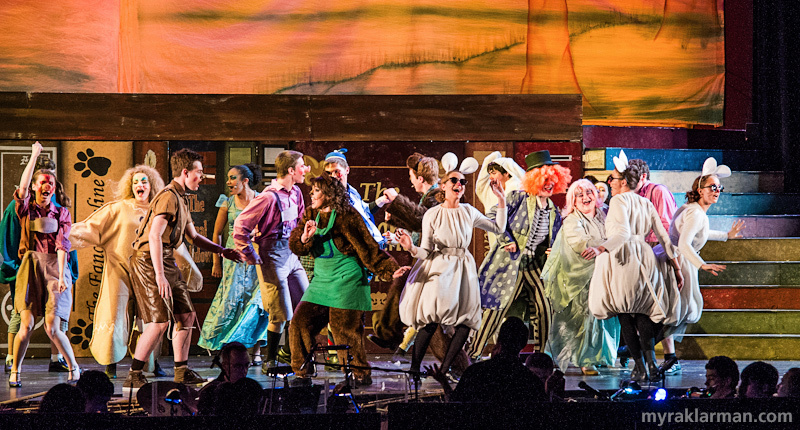 | Costume designer Mitch Fehrle sacrificed his very own feather pillow to create the perfectly mangy Ugly Duckling (Oren Steiner). | Gingy (Tasha Thomas) with her leg “glued” back on with icing. Sunflower (Gabrielle Keen) | The Three Little Pigs (Remington Reackhof, Sabra Satz-Kojis, and Jake Jadele) | An all too rare sighting of the Big Bad Wolf (of Little Red Riding Hood fame) with grandmother’s robe open. 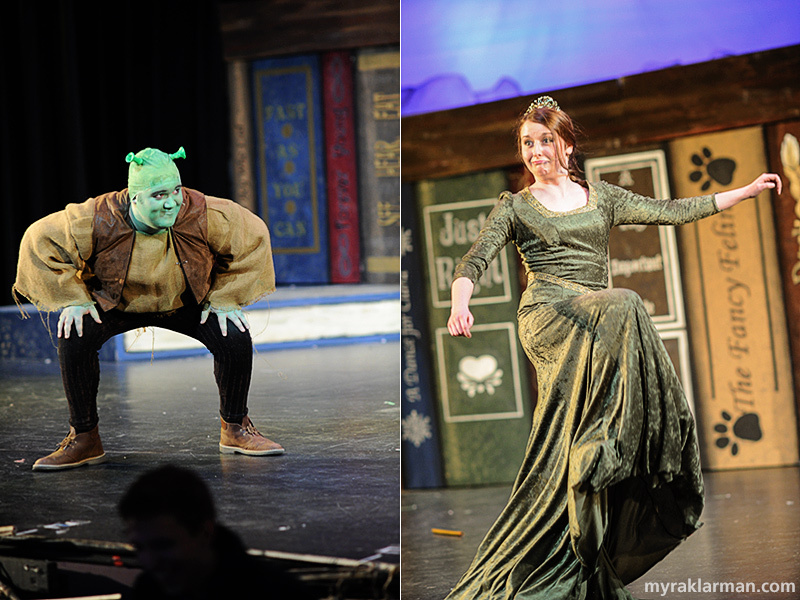 Dragon crashes though the window and takes down Farquaad, while Shrek and Fiona make their escape. 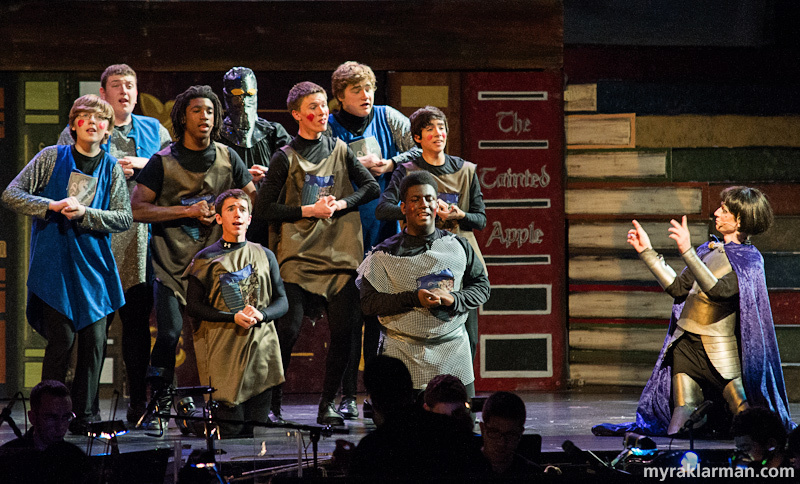 “I’m a Believer!” Pioneer Theatre Guild, we will always be believers. So cool. 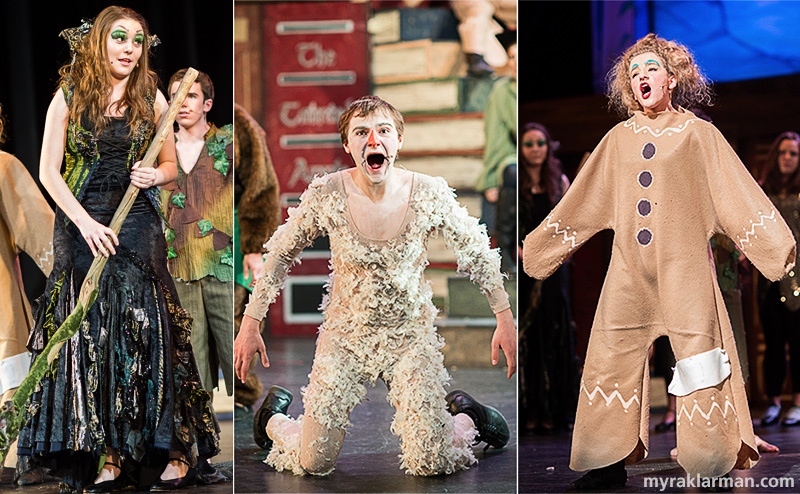 The costumes and makeup are amazing. I am particularly fond of Gingy (especially the hair) and Lord Farquaad. Photography brilliant as well. Thanks for sharing. Thanks, M.I.! The frame is made from 1/2” pvc pipe covered in a couple layers of fabric (some woven in strips). Hope that helps!